Canada's export credit agency, Export Development Canada (EDC), will issue a loan worth $4 billion for the implementation of the project on Khazar Islands housing estate construction in Azerbaijan carried out by Avesta concern, financial adviser of the Canadian company PROJ-G.E.T Consultant Inc, Sergey Gamayev, told journalists on Saturday in Baku. A relevant memorandum of understanding between Avesta and PROJ-G.E.T Consultant Inc. was expected to be signed on Saturday. PROJ-G.E.T Consultant Inc will act as the financial intermediary through which the EDC credit line will be opened. PROJ-G.E.T Consultant Inc also intends to conduct engineering work under the project, which will particularly include the creation of municipal infrastructure of the project. Gamayev said that the Khazar Islands project produces a big impression, and representatives of the company witnessed firsthand the operations carried out within the project. Khazar Islands, which is under construction on an artificial archipelago, will consist of 50 islands of different size with total area of 3,000 hectares on which 19 residential districts will be located. Avesta head Haji Ibrahim Ibragimov has said investors take great interest in the project, which is confirmed by the fact that until the end of April about 10 investors could start working there. The project will be implemented in three stages. The first stage, which is to be completed in 2017, envisions investments in the amount of $10 billion. The second stage will begin in 2015 and finish in 2020-2022, and the third one will start in 2017 and proceed till 2025-2026, Ibragimov said. The complex is slated to accommodate one million people, of whom 800,000 will be permanent residents, while the remaining 200,000 will be tourists. "Creation of such a complex in Azerbaijan will make a big contribution to the development of the tourism sector of Azerbaijan and accordingly will bring hefty receipts to the country's state budget," Ibragimov said. According to him, local population will account for 50 percent of the residential part of the complex, while the other half is to be made up by foreign citizens. Also, the tallest building on the planet, the 1,050 meter-high Azerbaijan Tower, will be built in the territory of Khazar Islands as part of the second phase of the project. The Tower construction is expected to cost $2 billion. The Azerbaijan Tower will be 200 m higher than the world`s current tallest building - Burj Khalifa, and 50 m higher than the Kingdom Tower to be built in Jeddah, Saudi Arabia. 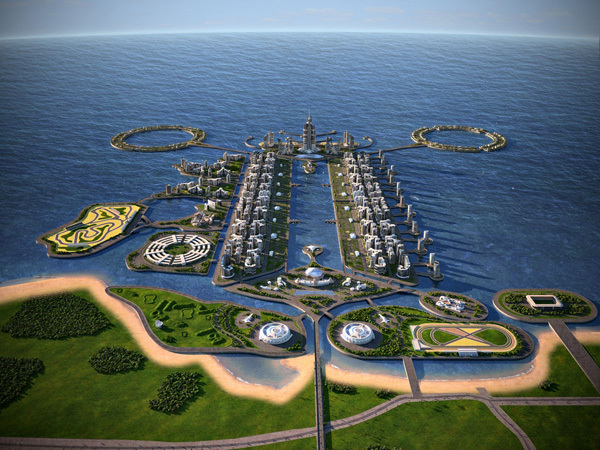 The cost of the new housing estate of Khazar Islands is initially estimated at $100 billion. In January, a contract with three leading world companies on investing $50 mln in the Khazar Islands project was signed. The companies will finance the construction of six buildings with total space of 200,000 square meters. The completed Khazar city will boast more than 150 schools, numerous hospitals, and clusters of parks, shops, and cultural centers. A yet-to-be-constructed airport will provide international access to the area. The islands will be dominated by high-rise buildings and resort-like accommodations, with miles of unspoiled beaches and warm, shallow waters. Special considerations were taken in the design of the island`s structures to withstand up to a 9.0 magnitude quake. Work on the project to date has been funded by the Avesta Group itself. The company hopes to reach annual profitability margins of 10-15 percent on investments.